Quicksort is a divide and conquer algorithm. It first divides a large list into two smaller sub-lists and then recursively sort the two sub-lists. If we want to sort an array without any extra space, quicksort is a good option. On average, time complexity is O(n log(n)). This post shows two versions of the Java implementation. The first one picks the rightmost element as the pivot and the second one picks the middle element as the pivot. The following is the Java Implementation using rightmost element as the pivot. You can use the example below to go through the code. Here is a very good animation of quicksort. The code given up produces a StackOverflow Error, and it does not compile. Can someone suggest why that might be the reason? If you change the test array, the correct output is not shown. Great explanation!! Understood the concept. Thanks for sharing. This would be a null pointer exception if x is null, hence a null check is required. As a stand-alone program it doesn’t matter, because you already know the inputs are good, but it’s good practice to handle it anyway. This is a misconception. Perhaps this was true decades ago, but the compiler knows that a division by 2 is equivalent to a bit shift by 1. Same with multiplication. It’s easy to do a benchmark, or just examine the Java byte code and you’ll see it’s the same. AKA, don’t do this, because it may be confusing for developers who come behind you who may not recognize that the bit shift is division/multiplication. I could be wrong but I think the running time for the partition part could be O(n^2) so this Quicksort does not have O(nlgn) running time. This is sort of true. The worst case runtime of quicksort is n^2, but on average it is nlgn, so we say it is nlgn. Running time is N log N for the average input. Doesn’t one of the pivot conditionals need to have an equals, such as =, instead of ? Otherwise, what happens if the pivot value occurs multiple times in the array? Inside the function we are again checking the same. In recursively sort two sub parts, it seems you don’t need to check relationship between low and j (high and i) before you call quickSort. Since you define a stop condition of low>=high at the beginning. 2(low)/2+(high-low)/2 = (2low-low+high)/2 = (low+high)/2. shouldn’t “if(i <= j)" just be "if(i < j)"? What is the point to swap i and j if both index where equal? ah no? He’s referring to get the difference first: (high – low), then use this divided by 2, then add to the starting position, which “low+” will be the last operation. I just wanted to understand one point.The above quickSort method excluding the recursion part modifies the array such that all elements less than pivot are on left side and all elements greater than pivot are on right side.Is this correct.My point is that the pivot will not be at the boundary but it will be somewhere in the right part ? Just a little problem with your statement. You mean to say they will not retain their *order* after sorting. Not places. Good tutorial, but it’s important to note that it’s not stable. If you have same numbers they will not retain their places after sorting. By the way you can also use following quicksort algorithm to sort it in-place. 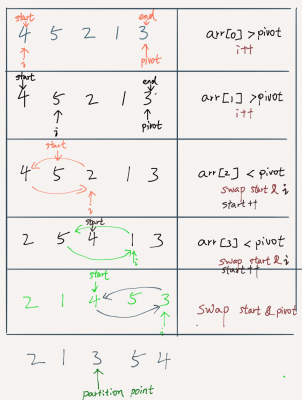 Quicksort is slightly sensitive to input that happens to be in the right order, in which case it can skip some swaps. Mergesort doesn’t have any such optimizations, which also makes Quicksort a bit faster compared to Mergesort. Just a little hint: (low + high) / 2 = low + (high – low) / 2.